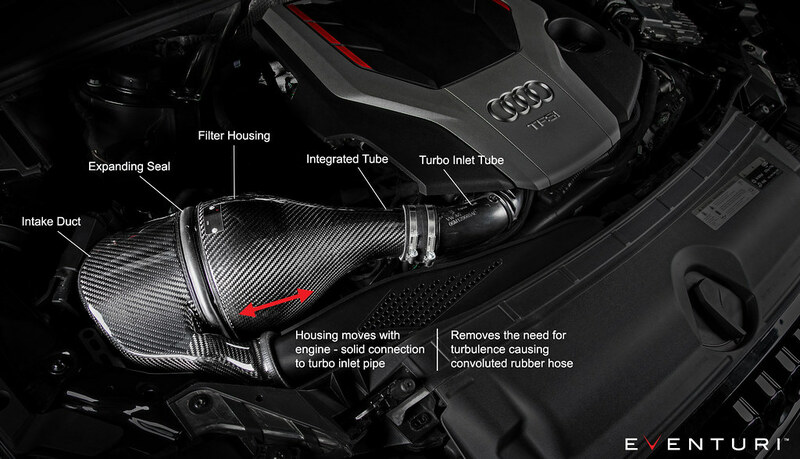 The Audi B9 RS4/RS5 Eventuri intake was developed to give less restrictive airflow to the turbo whilst maintaining low inlet temperatures. 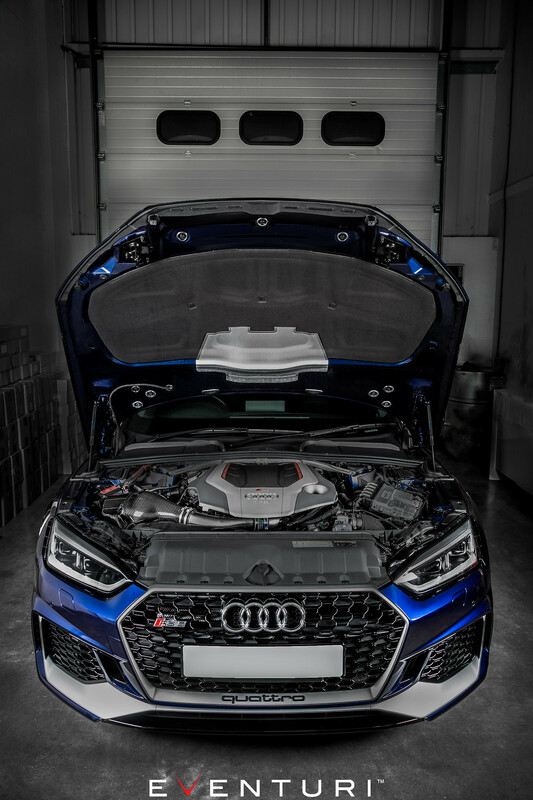 The RS5/RS4 engine bay becomes heat soaked very quickly so simply having an open cone system would result in better airflow but with higher inlet temperatures. We therefore completely re-engineered the inlet track from the turbo inlet pipe to the front grill with a highly efficient sealed system. The restrictive stock airbox and flexible plastic inlet pipe have been replaced with a Venturi filter housing and a duct system with smooth transitions. 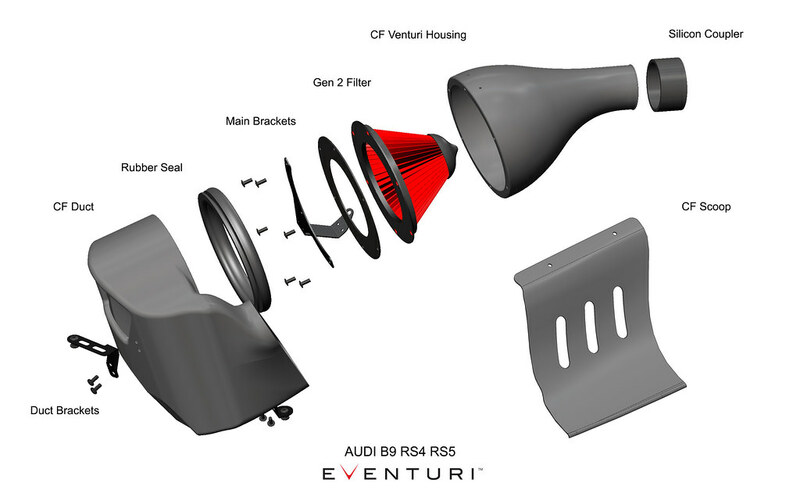 Furthermore, by removing the convoluted stock inlet pipe and replacing it with our one-piece Venturi housing and solid tube, the airflow is much smoother as it enters the turbo inlet tube. The resulting performance gains and aesthetics are industry leading for this platform. 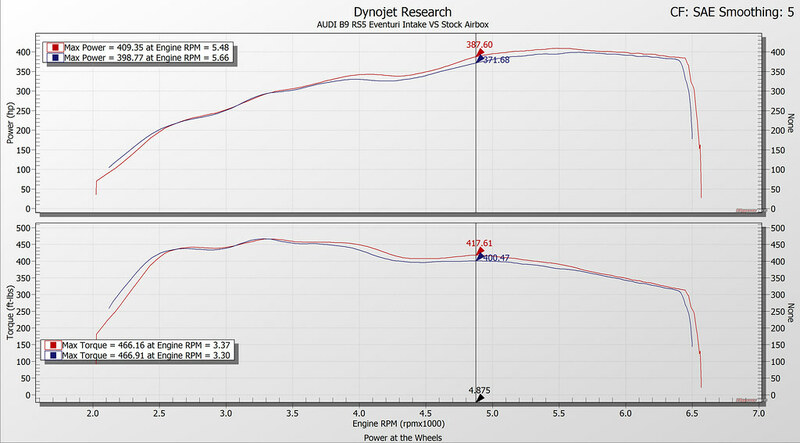 Below is an independent dyno graph showing the comparison between the Eventuri and the stock airbox on a B9 RS5. The car had no other modifications. As you can see, power and torque are increased through a large portion of the rpm range. This translates on the road to increased part throttle and full throttle response with the car pulling much more eagerly to the redline. The testing was done on the same day back-to-back and temperatures were monitored to ensure consistency. The bonnet was closed for all runs. 1) The sealed system keeps IATs low - especially with the front air scoop which forces air into the system. 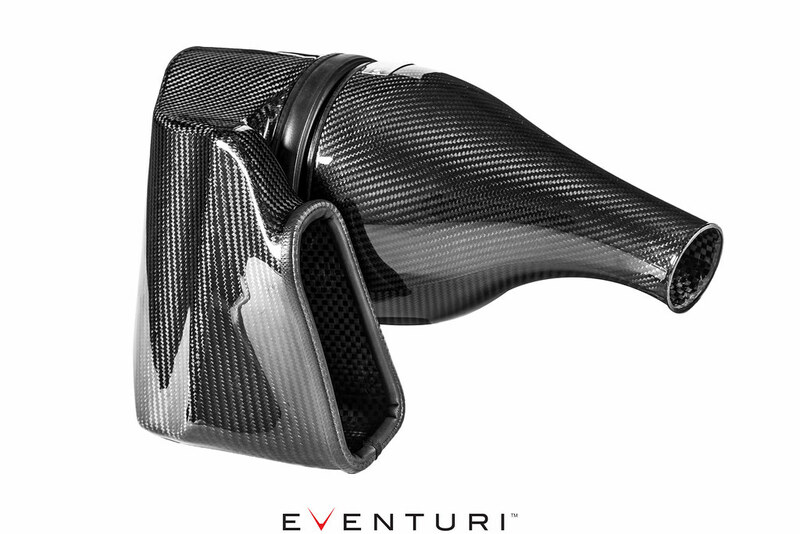 2) The Venturi housing provides a smooth transition from the filter to the intake tube with no convoluted rubber section. This helps the turbo to run more efficiently by maintaining laminar flow in the inlet track. 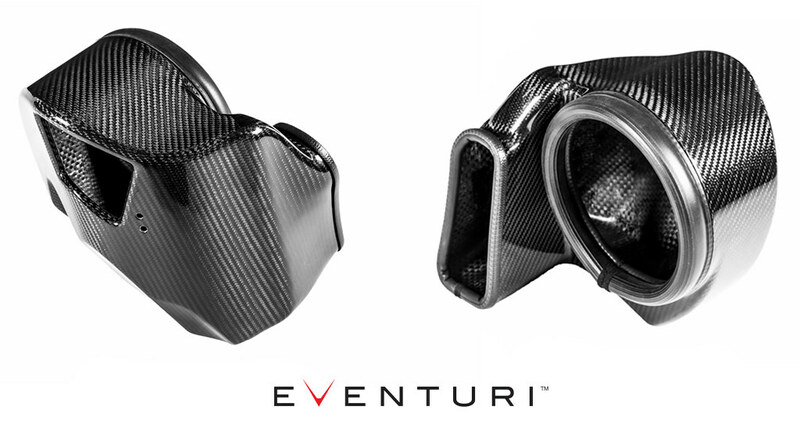 3) The entire system is constructed from pure pre-preg carbon fibre which is great at insulating from heat. The filter housing comprises of our bespoke generation 2 filter, the carbon pod and integrated tube. 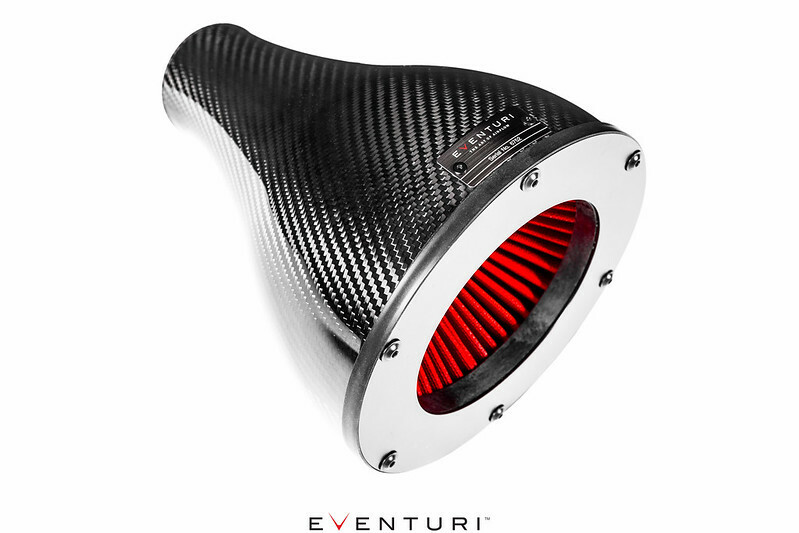 The carbon pod shrouds the reverse mounted filter and smoothly shapes the airflow down to the turbo tube which it matches in diameter to the turbo tube. 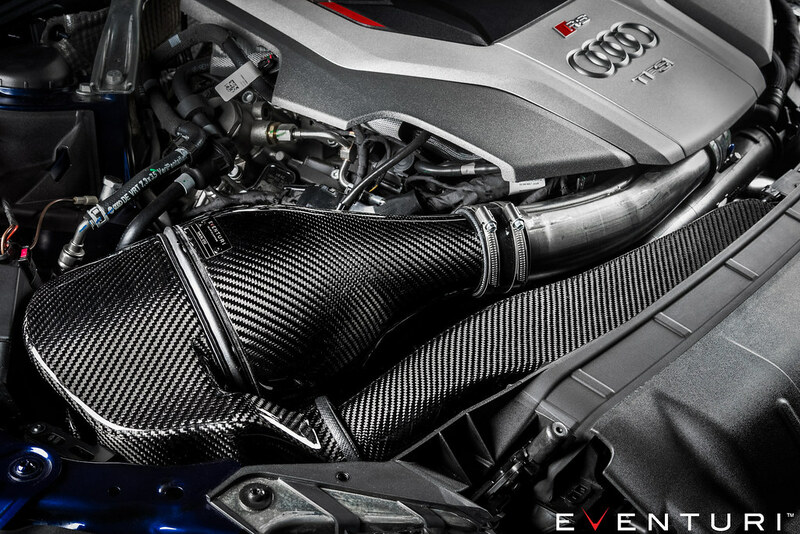 This is a key feature of the intake design where we have removed the requirement for a convoluted rubber hose between the intake and the engine. The filter housing and integrated tube extends all the way to the stock turbo tube and by mounting this to the engine, the entire filter housing moves with the engine. As the engine and filter housing moves under acceleration, it is able to maintain a seal to the duct through the use of an expanding rubber extrusion which is mounted to the face of the duct (see below). This smooth reduction in cross sectional area invokes the Venturi effect where the airflow accelerates whilst maintaining laminar conditions. It can be thought of as a large velocity stack - below is a diagram to show the comparison between our patent pending design and a regular intake system. Our bespoke filters aid the airflow moving through the housings and allow for an even velocity profile as the airflow exits the housings. Further details can be read in the Technology and Filters pages. The duct channels ambient air from the scoop to the filter housing. It also creates a sealed volume of ambient air before the filter so that there is a ready supply which the filter can draw from. The duct has been designed to take maximum advantage of the volume available in the engine bay. In order to ensure a good seal against engine bay heat - the duct also has a flexible rubber edging around the openings which press against the filter housing and OEM front duct creating the desired seal yet allowing the housing to move with the engine. To further enhance the airflow we added a secondary opening at the rear of the duct in the cold region of the engine bay. 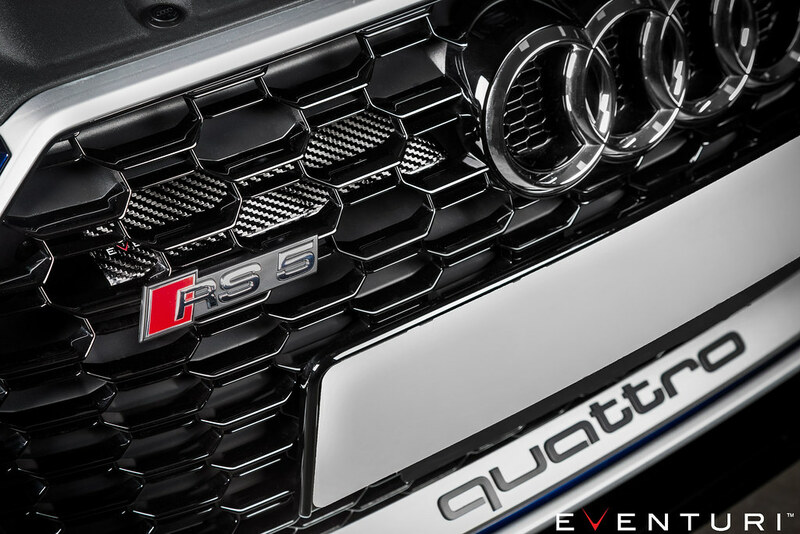 This geometrically complex piece is a key part of our B9 S4/S5 design. 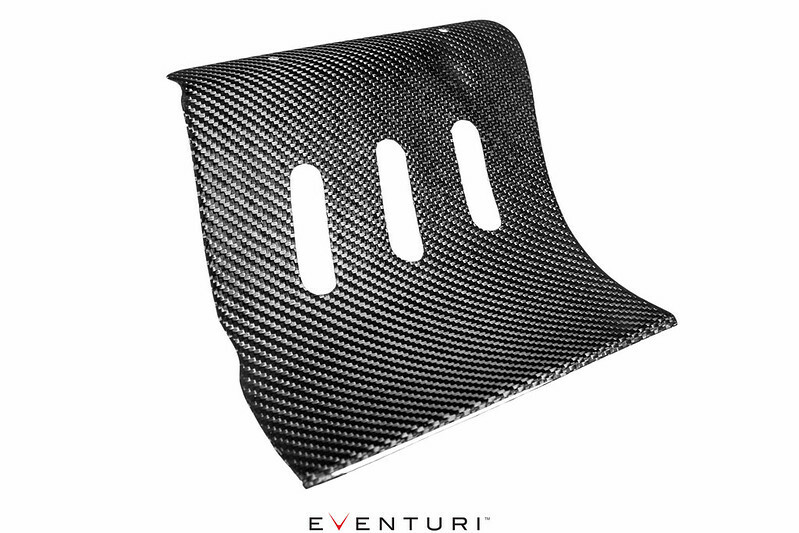 For the complete carbon fiber setup we have also crafted the secondary duct from carbon. This part connects the main carbon duct to the air entry region on the slam panel. It eliminates the holes on the OEM part and matches the rest of the system for a more finished aesthetic. The final carbon components in this system is the front scoop - essential to direct ambient air to the duct and then to the filter. The scoop was designed with a constant bend radius for maximum efficiency in directing the incoming air to the duct opening. It allows the inlet air temperatures to be as low as possible and increase the rate of drop in IATs after the system is heat soaked during a standstill. To ensure a perfect fit we spend a lot of development time on the mounting hardware. 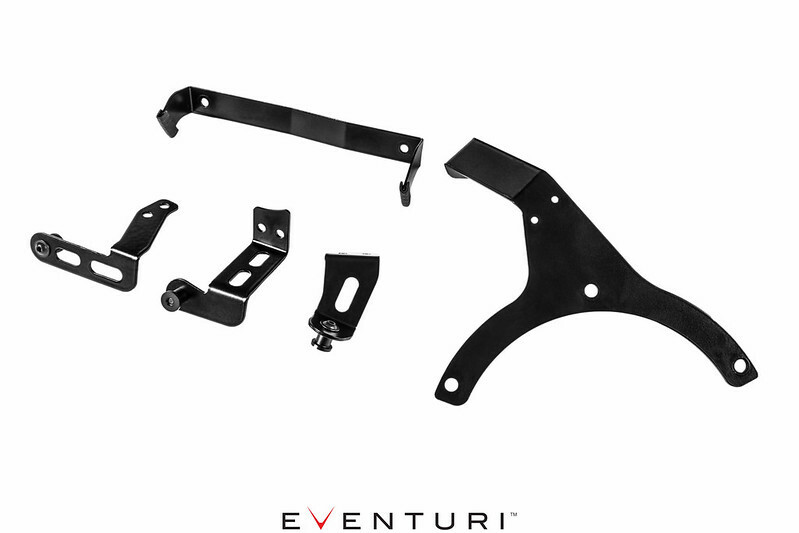 Like all our intakes, the brackets are specifically designed for the application and for the B9 S4/S5 system, the brackets are laser cut from stainless steel and then powder coated for durability. The CNC machined mounts are then secured to the brackets and push into the stock rubber mounts which the stock airbox uses to secure to. This ensures our intake fits just like the OEM system.